The National Blood Authority (NBA) has developed reporting and governance frameworks for the National Haemovigilance Program for Australia. It reports on serious transfusion related adverse events  occurring in some public and private hospitals. National Safety and Quality Health Service Standard 7 on Blood and Blood Products  requires health service organisations to participate in haemovigilance activities conducted by the organisation or state or national levels and to ensure that adverse events are included in incident management and investigation systems. If you need to contact a state or territory health department, please use the links below. The NBA’s national haemovigilance program is informed by the Haemovigilance Advisory Committee (HAC). The HAC comprises experts in transfusion medicine, science, nursing and epidemiology from both the private and public health care sectors. This group provides advice to governments on adverse event reporting originating from health service organisations and on national transfusion safety priorities. The HAC Terms of Reference (TOR)  (201.85 KB) document details the governance arrangements for HAC. The membership is included in the HAC Membership  (63.62 KB) document. The HAC TOR is approved by the NBA’s Acting General Manager on behalf of the Jurisdictional Blood Committee. A recommendation in the Australian Haemovigilance Report 2013  was to “Conduct a scoping exercise for a national haemovigilance system”. In response to the recommendation, the NBA developed an options paper for consideration by the HAC and the Jurisdictional Blood Committee (JBC). The outcome from that consultation is the Strategic Framework for the National Haemovigilance Program (Strategic Framework), endorsed by the JBC in September 2014. The Strategic Framework redefines the scope of national haemovigilance arrangements to emphasise activities that contribute to national standardisation, but suspends further work to develop a national IT system solution at this time. Although the NBA will not host a National Haemovigilance reporting IT system, the NBA will continue to collect, analyse and report haemovigilance data received from state and territories at the level defined in the National Haemovigilance Data Dictionary. 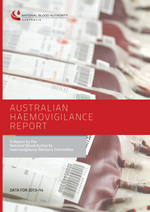 The Australian Haemovigilance Report Data for 2013–14 provides information on transfusion and donation related adverse events between July 2013 and June 2014. For the first time the report includes the analysis of transfusion related serious adverse events. When using the data from this report it is important to note that it has quality issues in relation to data completeness, standardisation and relevance. Australia has a voluntary reporting process at a national level and therefore will not be a complete dataset. The Australian Haemovigilance Report Data for 2011-12 and 2012-13 was developed by the NBA following receipt of data from states and territories. The report has been reviewed by the Haemovigilance Advisory Committee (HAC). This report provides information on transfusion-related adverse events between July 2011 and June 2013 and donation-related adverse events between July 2012 and June 2013. Australia has a voluntary reporting process at a national level and therefore will not be a complete dataset. 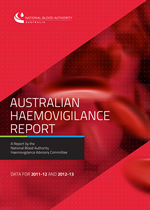 The Australian Haemovigilance Report 2013 was developed by the NBA in conjunction with the Haemovigilance Advisory Committee (HAC) and describes adverse transfusion events reported during 2009-10 and 2010-11. This report also includes, for the first time, a section on donor vigilance provided by the Australian Red Cross Blood Service. The Australian Haemovigilance Report 2010 was developed by the NBA in conjunction with the Haemovigilance Advisory Committee (HAC) and describes adverse transfusion events reported in a number of States and Territories during July 2008 – June 2009. The Initial Australian Haemovigilance Report was developed by the NBA in conjunction with the Haemovigilance Project Working Group (HPWG) and describes adverse transfusion events reported in a number of States and Territories over three-to-five years. The Australian Haemovigilance Minimum Data Set (AHMDS) enables consistent data collection and analysis of transfusion related adverse events to improve the quality of national haemovigilance reporting. The AHMDS was developed based on the Australian Institute of Health and Welfare (AIHW) Metadata Online Registry (METeOR) format and the International Society of Blood Transfusion (ISBT) standard haemovigilance definitions where possible. If these were not available from these sources then the Haemovigilance Advisory Committee agreed the definitions and standards. This second edition supersedes the first edition from 2016-17. The first edition of AHMDS (National Haemovigilance Data Dictionary) was published in 2010. NSW Clinical Excellence Commission  - The key role of the Clinical Excellence Commission is building capacity for quality and safety improvements in Health Services, including promoting and supporting improvement in clinical quality and safety in public and private health services. NSW Health Blood Watch  - A program initiated by the NSW Clinical Excellence Commission as a state-wide transfusion medicine improvement program. The web site contains information and resources for consumers and hospitals. Queensland Blood Management Program  - A program established to ensure the Queensland Government meets its obligations under the National Blood Agreement. It provides links to fact sheets, guidelines and business initiatives related to the management of blood and blood products. Queensland Health Patient Safety and Quality Improvement Service  - A service designed to maximise best-practice outcomes and minimise patient harm by providing support to Queensland Health. South Australian Department of Health BloodSafe Program  - BloodSafe is a blood transfusion safety and quality improvement collaboration between the South Australian Department of Health, Transfusion Medicine Services of the Australian Red Cross Blood Service and South Australian public and private hospitals and their transfusion service providers. The web site includes a set of tools, resources and links for clinicians and consumers. Victorian Blood Matters Serious Transfusion Incident Reporting (STIR) system  - A Victorian state government program aims to support and enhance best practice in patient blood management (PBM), and the stewardship of blood and blood products, for improved patient outcomes in Victorian health services.. The web site provides consumer information, tools, audits and reports on transfusion incidents. International Haemovigilance Network  - The International Haemovigilance Network (IHN) provides a forum for sharing best practice and benchmarking of data, as well as providing a resource for existing and new haemovigilance systems. This IHN web site provides access to documents, news, links and contact details for the network. IHN holds an annual haemovigilance seminar for member countries and researchers. The latest program and presentations can be found at http://ihs-seminar.org/programme . International Society of Blood Transfusion (ISBT)  - The International Society of Blood Transfusion (ISBT) is the premier international professional society for the field encompassing transfusion and transplantation science and medicine. The ISBT web site provides access to ISBT events and congresses, publications, working parties, news, membership and history information. WHO Haemovigilance Program  - This web site provides access to haemovigilance definitions, guidelines, global consultations, global databases on blood safety and contact information for the program. New Zealand Blood Service. Haemovigilance Program  - This link enables users to read and download the Haemovigilance newsletter, notification form and user guide as well as the Haemovigilance Program annual reports. These reports provide information on the adverse events associated with transfusion in New Zealand. They assist health professionals to better understand the risks associated with transfusion and to communicate these to potential recipients. Serious Hazards of Transfusion (SHOT) (UK)  - This site provides an overview of the UK Serious Hazards of Transfusion (SHOT) program. Annual Haemovigilance reports can be found under the 'SHOT Reports and Summaries' tab located on the left hand side of the screen. Transfusion Transmitted Injuries Surveillance System (TTISS) (Canada)  - This site provides an overview of the Canadian Transfusion Transmitted Injuries Section. Annual Haemovigilance reports can be found under 'National TTI Surveillance System (TTISS) - Program Reports'. U.S Biovigilance Network  - This site provides information on the U.S haemovigilance system, including background on the network, a list of organizations currently contributing data, related news coverage, and contact information for those interested in learning more about the network or haemovigilance.